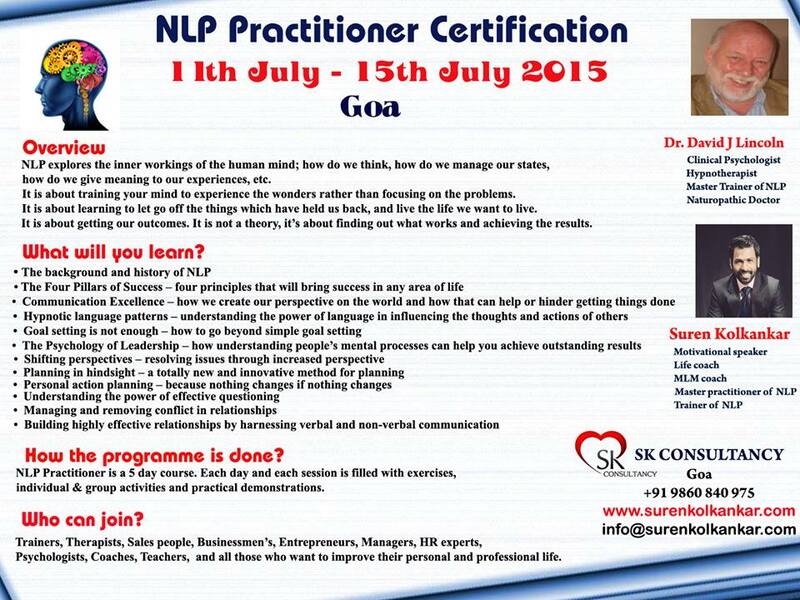 Why You Must Attend This NLP Training In Goa! Suren Kolkankar, NLP Trainer and Motivational Speaker with Dr David J Lincoln, a Clinical psychologist and a Master Trainer of NLP and Hypnosis are conducting a 5 days intensive NLP Practitioner Certification Course between 11th July – 15th July 2015 at Goa, India. This blog post will uncover the many reasons why you must attend this training and some insights on why I personally love this technology. It was two years back when I discovered this field through a dear friend, during that time I gave up my day job to figure out life and you won’t believe what I learned back then, still works in every single situation of my life in my favor. Often referred as the science of excellence, Neuro-linguistic-programming explores the inner workings of the human mind: how we think, how we develop our desires, goals and fears and how we motivate ourselves, make connections, and give meaning to our experiences. It is often our inner map of the world that reflects our outer reality and if we are not happy or satisfied with the experience, we can change and alter the inner mechanism for effective outcomes. Here are three major insights that I acquired from a beginner’s workshop. I would call them the tools that are helping me inch forward and live life to my highest potential till date! There is a great difference between mind and mindset. If you have a fixed mindset that claims “I know everything” – your map of the world will always remain limited and small. To expand your horizons and allow new experiences to unfold, you have to posses a flexible mindset, inquisitive and eager to learn! The meaning of communication is not in the intent but in the effect of it. Therefore it’s important to take feedback. One’s intention is according to one’s own model which differs with everyone else’s. Also, though non-verbal communication speaks louder than words but we can’t deny that reliable information comes from the mouth. Always ask “RIGHT” questions instead of making assumptions and gain the reciprocation of the communication. This can help in enhancing relationships, conflict resolution and improving conversations. Suspecting our own thoughts is highly effective to understand its origin. We all are creating the stories of our lives based upon the beliefs we hold dear to our hearts. But the fact is that these beliefs are nothing but repetitive thoughts which were smeared on us by our parents, teachers and social groups and if you are facing difficult times and struggling with success or happiness then questioning your thoughts in that particular aspect and turning them into positives can assist in creating long lasting change. After this workshop my mind was cracked open for evolutionary process and I experienced a sense of power and control over my life. I wonder if a two day workshop can do so much then what would a Practitioner Certification can perpetrate. This highly practical and fast-paced five-day programme will offer you the opportunity to discover how NLP can help you utilize simple and powerful strategies and techniques to achieve peak performance. Discover how high achievers attain excellence and how to replicate their success. Sub-modalities: changing the way you think! You will take away skills that you can immediately put to great use. The training will be delivered in a highly interactive, fun, experiential and creative manner where you will be able to go through live demonstration of the techniques and apply them. After the successful completion, the participants will be awarded with a certificate which is fully approved and recognized by the Association of Neuro- Linguistic Programming (ANLP), one of the most professional and trusted independent NLP membership organisations in the world. Get yourself registered for this training in the most amazing location soon. You can also check this interview post on Decoding NLP with Suren Kolkankar. Do comment if you have ever tried using NLP techniques in your life? Embrace The Chaos| How Am Dealing With Stress & Overwhelm!